WHERE CAN YOU RECYCLE YOUR CHRISTMAS TREE? Dublin City Council has agreed to my suggestion that the Grangegorman Bring Centre be open on Sundays throughout January to facilitate householders in recycling Christmas trees and other Christmas packaging. The Grangegorman facility will be open between 12noon and 4pm on January 8th, 15th and 22nd. • Saturday 7th & Sunday 8th: 10am – 4pm. • Monday 9th – Friday 13th: 8am – 8pm. • Saturday 14th & Sunday 15th: 10am – 4pm. Further details are available on http://www.crokepark.ie or alternatively, you can email me at raymcadam@gmail.com. Following the announcement late last year by Shelbourne F.C. that the club has agreed to ground share Dalymount Park with Bohemians, I sought an update from the City Council on the progress of advancing the redevelopment of Dalymount. Officials informed me that as a result of the recent purchase of Tolka Park, Dublin City Council is now in the position to move the Dalymount project forward. The Council is in the process of drawing up tender documents to be in a position to procure an integrated design team to draw up a detailed design for the project. In addition to this, a steering group has been put in place with representatives from Bohemian F.C., Shelbourne F.C. (who both will become the anchor tenants of the new stadium), Football Association of Ireland and Dublin City Council’s local area office. This group will advise the Council on design issues and requirements. I believe this project should be advanced promptly but in a way that allows for the widest consultative process possible so that residents in Phibsborough can have their say on progressing this redevelopment plan. Minister Paschal Donohoe and I will be meeting Dublin City Council officials to discuss the project further in the coming days. A planning application seeking to redevelop the site at 274 North Circular Road is currently before Dublin City Council. The application was lodged on December 5th last and permission is being sought to construct a 444 bed student accommodation complex. Nine separate development blocks are proposed, ranging in height from one to seven stories high. 11 car parking spaces and 210 bicycle parking spaces are also provided for in the planning application. Vehicular access to the development site will be via the North Circular Road with pedestrian access being permitted both along the North Circular Road and from the lane way from Rathdown Road. The closing date for submissions or observations to be lodged with the Planning Department of Dublin City Council is January 17th next. If you would like to discuss the particulars of the planning application with City Council officials, please let me know so that I can organise such a meeting on your behalf. 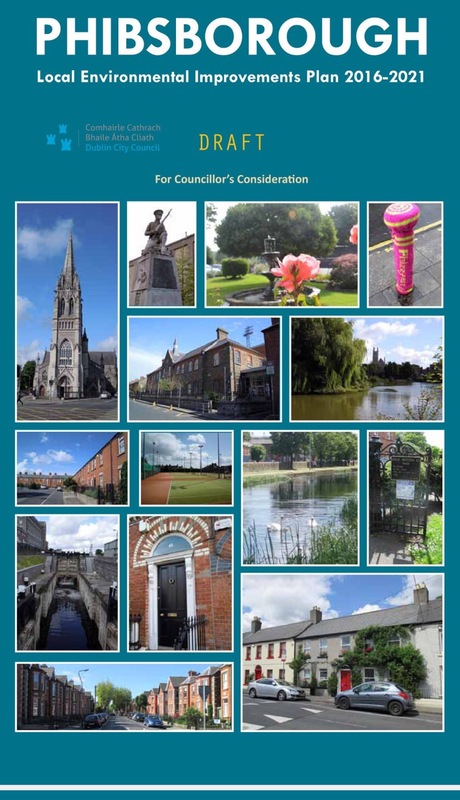 Despite the City Council publishing the draft Local Environmental Improvement Plan for Phibsborough, the implementation group has only now been put in place. Prior to Christmas, I was selected to as the Inner City Councillor on the Implementation body with another Councillor from the North West administrative area also to be appointed. The first meeting of the Implementation body which, I expect, will involve local groups, is due to take place this month. Throughout the coming months, I will share updates with local community groups and Residents’ Associations as we seek to implement the objectives contained in the Local Environmental Improvement Plan. If you have any questions or queries about the Plan, its objectives or how the works will take place, please email me at raymcadam@gmail.com. The Public Domain Unit of Dublin City Council has been removing incidents of graffiti from various buildings and locations across the Phibsborough district. The Council’s Corporate Contractor and its own Waste Management Services have removed graffiti along the Phibsborough Road, Mountjoy Parade, St. Joseph’s Parade, Geraldine Street, Auburn Street, Binn’s Bridge and Royal Canal Bank. If there are items of graffiti on your street or avenue, please contact me at raymcadam@gmail.com and I will arrange for its removal. The Traffic Advisory Group has recommended that Double Yellow Lines be installed on both sides of Berkeley Avenue and a No Parking Sign erected. Following repeated requests from Minister Paschal Donohoe and I, the Transportation Department of Dublin City Council has reviewed the traffic management of this junction. As a result of this review, outbound traffic will now be stopped for a short period to allow right-turning traffic to turn right from Dorset Street onto Synnott Place. This turn will be in effect from 3.30pm until 7pm every day to allow turn right in the afternoon rush hour traffic period. This is a very welcome decision which I will continue to monitor on behalf of the Leo Street & District residents group. Broadstone residents have been in touch with me to express concern about the continued Parking of coaches and buses near their homes on Great Western Way. In light of these concerns, I have requested that the issue be included on the Dublin Central Area Committee meeting this month. Officials have now confirmed that they report back to me on the amount of emissions due to the volume of coaches parked there and how long more Broadstone residents can expect to have the coaches being parked near their home. Transportation Engineers have yet to make a decision on whether the footpaths at the entrance to Rosemount Road will be widened in order to slow vehicles down as they turn in from the North Circular Road. I expect a decision to be presented to Councillors next month. As Chairman of the Dublin Central Policing District, I have been working with individual community groups to tackle problems with anti-social behaviour. Residents living in the vicinity of Blessington Basin and the Linear Park along the Royal Canal have highlighted issues with public drinking and drug dealing. Throughout November and December, Community Gardaí from Mountjoy put in place a plain clothes operation in the area to apprehend those involved. To date, Gardaí have completed a number of stop and searches under the Misuse of Drugs Legislation. The 2017 Policing Plan for the Phibsborough district will see an extension of this operation taking place. In 2016, property related crime was down 8% across the North Inner City, Shop theft down 8% and theft from vehicles down 13%. Following significant 20% reductions in burglary related crime across 2014 and 2015, 2016 an increase of 2%. Whilst not statistically significant, for anyone whose home has been broken into, it is a 2% increase too much! Stop and searches under the Misuse of Drugs legislation in the North Inner City has fallen back significantly this year to 5265 searches compared with 16,299 in 2015. The Gardaí are still apprehending those involved in the sale and supply of illegal drugs but the level of intensive policing that has been required since the shootings in the spring, has meant that ‘normal’ policing has been affected. That is why both Minister Paschal Donohoe and I will be working with the Tánaiste & Minister for Justice to ensure that as many new recruits as possible from Templemore are located in Mountjoy Station and across the North Inner City in 2017. €30 million has been made available to develop sports infrastructure around the country by the Fine Gael-led Government and I strongly encourage all clubs and sports organisations to prepare for the application process and register online now. Minister for Sport, Patrick O’Donovan T.D., has confirmed to me that €30 million is going to be made available to develop sports infrastructure around the country under the Sports Capital Programme in 2017. I have raised the continued development of this programme since the Government was formed in May. In 2016, more €22.8 million was paid out to 680 organisations to support the development of sports facilities and the purchase of sports equipment through the excellent Sports Capital Programme. I want to see Inner City clubs and organisations benefit as much as possible from this funding and so I encourage all involved to prepare the necessary paperwork for their applications in advance. Inner City clubs and sports organisations looking to apply should register now at http://www.sportscapitalprogramme.ie. Online applications will then be accepted from the 23rd January to the 24th February, 2017. This entry was posted in Phibsborough. Bookmark the permalink.